Scottsdale, Ariz.– LevRose Commercial Real Estate, a leading Scottsdale-based commercial real estate brokerage and management firm, recently closed the sale of Hayden Professional Park in Scottsdale for $8.75 million ($133 PSF). The 65,731-square-foot office space located at 3200 N Hayden Road was purchased by Petwin Properties from Blue Diamond Properties. LevRose Commercial Real Estate represented both the buyer and seller. Keri Davies, Jason Reddington and Jon Rosenberg facilitated the sale on behalf of the buyer and Matt Leonard and Hunter Peek on behalf of the Seller. 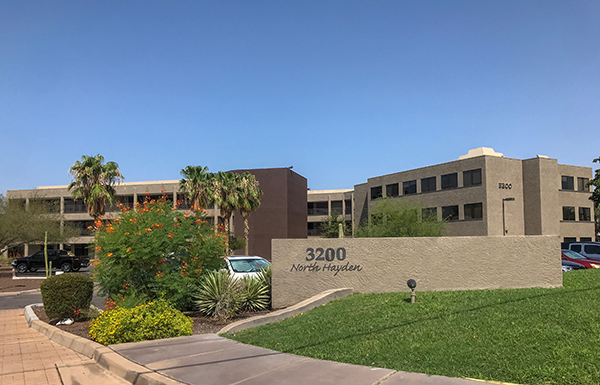 LevRose helped Petwin Properties add to its Arizona portfolio by acquiring the neighboring project to one of its existing assets, expanding its total office complex to nearly 100,000 square feet and over six acres. With expertise in both office, retail and industrial properties, LevRose Commercial Real Estate handles tenant and landlord representation and sales transactions. LevRose Commercial Real Estate has been serving the Valley since 1992. Locally owned LevRose is affiliated with TCN Worldwide, a consortium of independent commercial real estate firms providing complete real estate solutions locally, nationally and internationally. For more information on LevRose Commercial Real Estate, please visit www.LevRose.com or call 480-947-0600.